The Maybelline Dream Velvet Soft-Matte Hydrating Foundation is Maybelline's first hydrating matte foundation that provides 100% velvet-smooth perfection with a unique gel-whipped formula that is ideal for normal to combination skin. Available in 12 different shades, this refreshing gel-whipped foundation leaves complexion perfected and smooth with a velvety, soft-matte finish while skin stays hydrated for 12 hours. Maybelline's Dream Blender is a latex-free beauty blending sponge that has a built-in handle for effortless and mess-free application. It delivers even foundation coverage and a smooth finish. It is ideal for gliding over large areas and targeting hand-to-reach curves. I like the packaging of the product - a squeeze tube gives control of how much product comes out. As for the foundation itself, it comes out as a mousse consistency but once applied, it felt like a liquid foundation and was easy to blend. 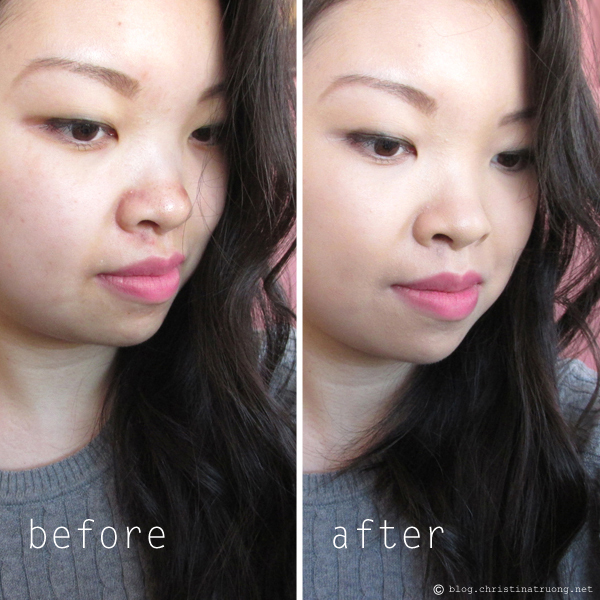 It's a buildable medium to full coverage - it was able to blur my imperfections and acne scars. It went on smooth, lightweight and provides a soft, velvety, matte finish - a very natural skin finish - doesn't feel like foundation was applied. Although the foundation seems great, I would not recommend this to someone who has dry skin - dry patches will be very noticeable after a few hours of wear. Another thing to note, use a setting powder/spray, touch-ups are needed throughout the day. If not using a setting powder/spray or blotting sheets, the foundation will still give a matte finish at the end of the day but with a shiny/greasy-look where face gets oily, in my case, t-zone area. And subtle or not, the foundation sits on wrinkles and makes it fairly visible close-up around the face. STEP 1 - Dab a small amount of foundation onto blender. Alternately, place foundation on back of the hand and apply to blender for added precision. STEP 4 - To clean, rinse with water and a gentle soap or makeup remover. * Pro Tip: For lighter foundation coverage, wet and towel dry the blender before use. The Blender is not as spongy as I thought it would be. It's more towards a firm and stiff kind of sponge. It doesn't create that "bounce" effect. When applying the Dream Velvet Foundation, it did a good job at blending. I used the blender under my eyes and nose and it did a great job at really getting into those areas. I wouldn't recommend this product to use all over your face - you're better off using a brush or a spongier-sponge. I would, however, recommend using it when concealing your under eyes, nose, and basically any place around the face that needs precision coverage. Cleaning the Blender: Expect the sponge to be stained. With water and mild soap, cleaning the Blender was not a problem but because there is a handle, it's really hard to clean as I was hesitant the sponge part would fall out as I'm cleaning. 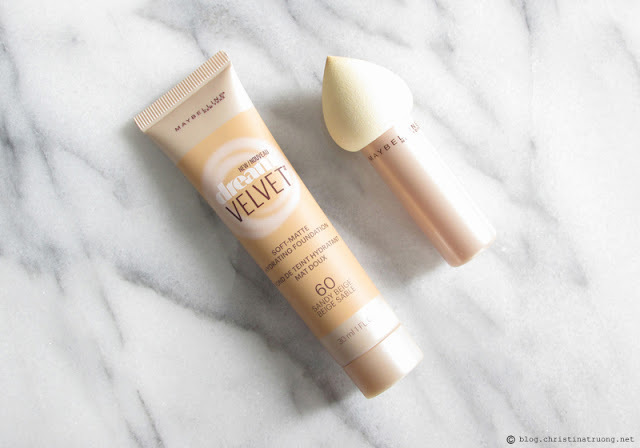 Overall, I'm 50-50 about the Maybelline Dream Velvet Foundation and Blender. I like the packaging, foundation coverage, the soft-matte finish, and the sponge was great for blending in hard-to-reach places. However, I didn't like the fact that the foundation picked up the dry spots on my face and that it left wrinkle creases. Also, the shades online can be a bit misleading, it's best to head to a store and do some swatches. What are your thoughts on Maybelline Dream Velvet? Have you or would you purchase the foundation and blender? I grabbed this foundation on sale at Shoppers for $8.99-- can't wait to give it a try! Wonder if this foundation would work better for my oily skin. That sponge seems like a great idea though!